Good morning, dear tea friends! I’m back this week to share another cup of tea but with a heavy heart that grieves for all those affected by the unspeakable violence that took place in our beloved city and state this week. I pray for healing and for justice and to Martin, Lingzu, Krystle and Sean – you will not be forgotten. This morning’s tea is a 2013 first flush Darjeeling from the Glenburn Estate. Three weeks ago, I reviewed another first flush from last year’s harvest at the Glenburn Estate. This 2013 tea is lot number DJ-17, assigned by the tea estate. 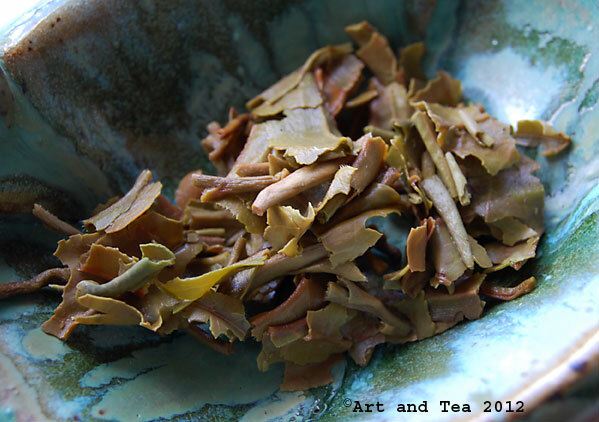 I found the leaf on this tea quite interesting in that it was a combination of various colors – russet, olive, spring green, dark brown – and sizes – whole intact leaf, tips and huge broken pieces. 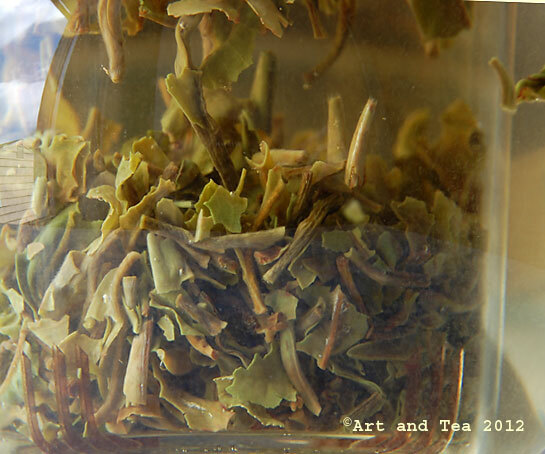 I steeped the leaves for 4 minutes, pushing the brewing time from my normal 3 minutes for a Darjeeling tea. The dark golden tea liquor has a light floral aroma. The flavor is smooth (even at 4 minutes!) and sweet with pronounced floral notes and a hint of that tropical banana note I find in a lot of first flushes. The finish has a citrus tang to it that lingers in my mouth. In my next steeping, I might even push the time on this light-bodied black tea a little more to see what happens. As the tea cooled in my teacup, I found the flavor lightened up somewhat. I was surprised at how smooth the liquor is even when cooled. As I slowly sip my tea and gaze out the window, I notice peeks of brilliant blue sky here and there amidst the dark gray clouds. Good morning, dear tea friends! I’m back this week with a revisit to our 2012 harvest Glenburn Estate first flush Darjeeling. Last week, I reran my post from last April, when I reviewed it shortly after its arrival. This tea is a very early harvest from the first flush season. The leaf is quite green with silvery white tips threaded throughout the green leaf. That said, this tea has been processed as a black tea. Last year, I steeped the leaf for 3 minutes in just under boiling point water (200F). This year I steeped the leaf for 4 minutes in boiling point water (212F). As I lifted the infuser from my glass teapot, I inhaled a delicate floral aroma from the pale gold tea liquor, as last year. Last year, I photographed a pile of the wet tea leaves. This year, I wanted to see what a leaf pile consists of so I lifted out some individual pieces. I see tiny buds (baby leaf) mixed with broken pieces of whole leaf. Look at the serrations on the edge of that leaf to the right. The tea liquor color is lighter than the first flush tea I reviewed 2 weeks ago, from the Thurbo Estate. I’m not sure why but it could be because this tea was harvested quite early in the season. The tea estates assign “DJ” numbers to the tea lots. This tea’s “DJ” number is 4 whereas the Thurbo lot is 45. Perhaps the Thurbo was harvested a couple of weeks later in the season? At 4 minutes, the tea is quite smooth and very flavorful with pronounced floral notes, just like last year. I even remarked in last year’s post that it would be interesting to push the steeping time as the tea was quite smooth. I think I’m going to try 5 minutes on my next steep. I’ll let you know next week how it tasted. So, my experiment was a success in that it showed how amazingly well this tea has held up a year later. Sometimes I talk to customers who tend to shy away from the teas from older harvests. I say – try a sample. You will probably be most pleasantly surprised! 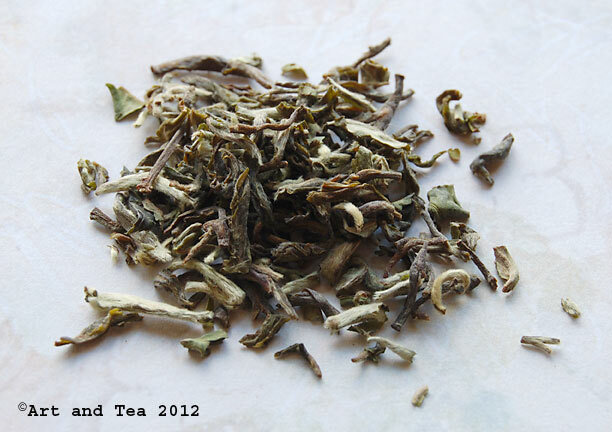 I’ve just heard this week that we have three 2013 first flush Darjeelings arriving within the next several weeks. Oh, happy day! I will post a review as soon as they arrive. Good morning, dear tea friends! 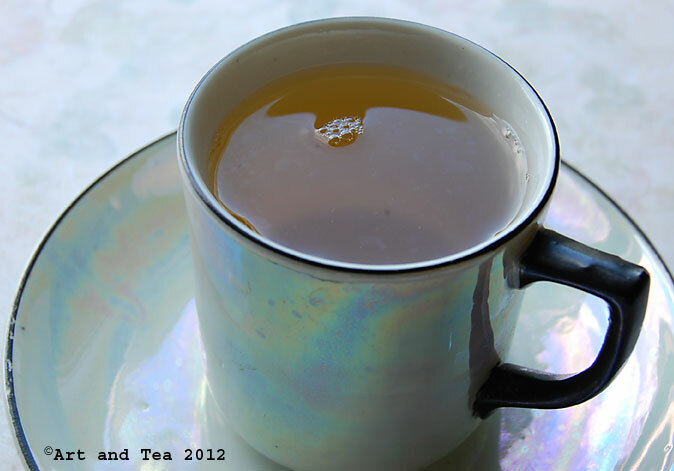 This morning I am re-running a post from last April on the Glenburn Estate first flush Darjeeling, harvested in 2012. Enjoy reading it again and stay tuned for next week when I’m going to steep up a pot and review it again. Hello again, my dear tea friends! I’m happy to be back to share another cup of tea with all of you. This morning I’m enjoying another first flush Darjeeling, this selection from the Glenburn estate. So far, 5 first flushes have arrived and I have to say that this one is my favorite so far. The leaf is from the first plucking of the season and, as you can see from my photo, it’s filled with the silvery white tips of the tea bush. So new, so tender. The leaf shows off its gorgeous green color as it steeps. I steeped for 3 minutes in just under boiling point water, around 200 degrees F. Remember that this is not a green tea but has been oxidized and processed as a black tea. Ok, back to the tea. 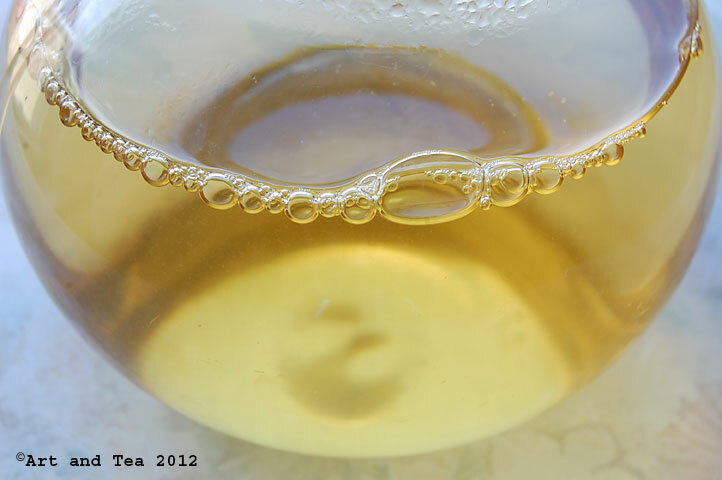 The tea liquor steeped up to such a pale, delicate golden color. A sweet aroma of flowers wafted up from my glass teapot as I gently removed the infuser basket. While I do love notes of tropical fruit and banana in a first flush tea, my first love has always been the floral notes. This tea is a perfect example of that – in the aroma and pronounced in the flavor. The liquor is so smooth that you could probably experiment with pushing the steeping time a little bit. If you do, please let me know what you think. Have a wonderful week filled with many delicious cups of tea!